While waiting for your parts to ship, you can 3D print the enclosure. The smartphone consists of two 3D printed parts that make up the enclosure: The top and the bottom. Download the .stl files on thingiverse http://www.thingiverse.com/thing:752746. If you do not have access to a 3D printer, you can pay a company like Shapeways to do it for you. If you would like to customize the case to suit your needs, download the Solidworks files from my Github page. I myself paid a company to do the 3D printing for me because I do not have the funds to buy one myself. If you would like more 3D printed projects from me, please vote for the tyfone in the 3D Printing contest. Thank you! Start by wiring everything together. In the Fritzing diagram, there is a Raspberry Pi. Instead of connecting to the Raspberry Pi, connect your wires to the 26 pin male header on the PiTFT. Now that we have that out of the way, lets start making connections. Connect “bat” on the Adafruit FONA to “bat” on the Power Boost. Solder a wire from GND on the FONA to GND on the Power Boost. Solder a wire from GND on the power boost to one terminal on a slide switch. Connect the 5V line on the Power Boost to a 5v pin on your PiTFT. Solder a wire from the middle terminal of your slide switch to the “EN” pin (Enable) on the Power Boost. If you slide the slide switch the LEDs on the Power Boost should illuminate and the Raspberry Pi should power up. The PiTFT backlight should also turn on. If you have a PiTFT image on your Pi’s SD card the screen should also boot up. Otherwise, it will just stay solid white, which is just fine for now. Most likely, no LEDs will illuminate on the FONA. To turn on the FONA, hold in the Key button on the device for two seconds or pull GPIO 18 on the Raspberry Pi high for two seconds. If you can power the Pi, TFT, and FONA from the battery and turn it all off from a switch, you are ready for the next step. Now that power connection are done, we can continue on to wiring up the UART to the Raspberry Pi, the speakers, and the microphone. Lets get started. Solder the 8 ohm speaker to “spk +” and “spk -” on the FONA. The polarity doesn’t matter. Solder the red wire on the electret microphone to the Mic + pin on the FONA. Solder the black wire on the electret microphone to the Mic – pin on the FONA. Connect the “RI” (Ring indicator) pin on the Adafruit FONA to pin 7 (GPIO 4) on the PiTFT. Connect TX on the FONA to pin 10 (RX) on the PiTFT. Solder RX on the FONA to pin 8 (TX) on the PiTFT. Solder Vio on the FONA to bat, also on the FONA. If you want, you could also use a 3v3 line on the Raspberry Pi. Snap the uFL antenna onto the uFL connector on the FONA. If you power everything on now, it should behave the same as it did in the last step. In the next step, we will be setting up the FONA by adding a SIM card making it capable of communicating over a cellular network. Now that the wiring is complete, we can add a SIM card to make it possible for the FONA to communicate over a cellular network. The FONA uses 2G data networks, like T-Mobile. The FONA does not work with 3G or 4G networks. AT&T is planning to shut down their 2G network in 2016, so we will be using a T-Mobile SIM card activation kit. The FONA uses a standard SIM card, so a Micro or Nano SIM cards will not fit. Once you have a card, activate it by following the steps at t-mobile.com/activate. When you are done, insert the card into your FONA and power everything on. If the red LED on the FONA is blinking every 3 seconds, your FONA is connected to a cellular network! In the next step, we will setup the software to get your Raspberry Pi communicating with the FONA. If you are not in an area with T-Mobile coverage, any network with 2G GSM service will work just as well. Expand filesystem is a must. Enable SSH. This is essential because the A+ only has one USB port. End setup and reboot your Pi. Your phone will not have a keyboard, so in order to access a command line you will have to setup WiFi and use ssh. In the desktop, put in your network information using Wifi Config. Shutdown the Raspberry Pi and insert a Wifi dongle. If you are still unable to connect via ssh, try using a USB hub to get going. More info on setting up WiFi can be found here. Once you are connected over SSH, you can clear the Desktop icons and remove the taskbar to make your phone look more professional. The steps below are not necessary and may not work in later versions of Raspbian. you should get “OK” back. If you don’t, check your connections. If you do, the FONA is ready for operation. In the file, change the “rotate” parameter to 180. The script will calibrate the touchscreen to work with the new orientation. In TYOS, make a call and send a text message to make sure everything works. Once everything is working perfectly, we can set up TYOS to start on boot so no ssh is required. The –power tag turns on the FONA. Without it TYOS assumes the FONA is on. Make sure you do not include .png at the end of the line. Now reboot your Pi. TYOS should startup on boot! Now we can secure everything into the case completing the smartphone. Using some hot glue, glue the speaker and the microphone it the their slots. Using the M2 screws, screw in the Raspberry Pi camera. Route the ribbon cable so it is out of the way of any other electronics. Using M2.5 screws, screw the Raspberry Pi A+ with SD card and USB Wifi down into the case. Connect the Pi camera ribbon cable to the Pi with the blue facing the camera. Also using M2.5 screws, screw the FONA SIM card up into the case. Organise the wiring making sure it does not interfere with any of the other electronics. Wrap the Power Boost in electrical tape to prevent a short. Sandwich the Power Boost and battery between the Raspberry Pi and PiTFT. Hot glue the slide switch into the switch slot on the top part of the case. Using 4-40 screws, screw the top and bottom halves of the case together. Congratulations! 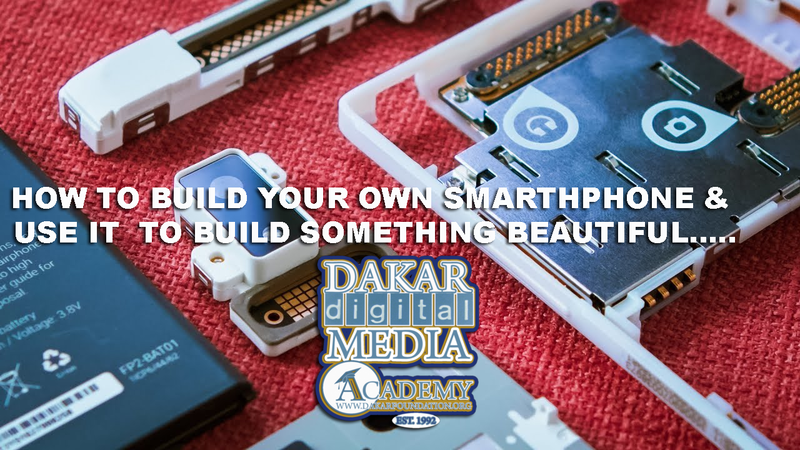 You have just built your own smartphone! If you don’t like the phone to be called “tytelli” just change the logo in /home/pi/tyos/graphics/logo.png to whatever you wish, and lets start using it to develop apps, shoot video, edit, and eventually stream some content, Okay?